Dr. Henry Steadman is looking forward to a great day when he's pulled over by the police for a minor traffic issue. The situation soon escalates to the point that several officers arrive and Henry can't figure out what's going on. Eventually, things settle down and the other officers leave, but as he's waiting for the remaining officer to write out a warning, another car pulls up and the officer is shot dead. Henry quickly realizes that he'll be the prime suspect so he chases after the other car, hoping to clear his name. 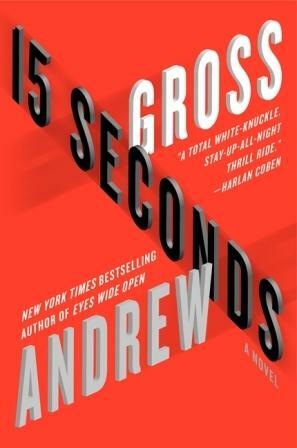 15 Seconds by Andrew Gross is a fast-paced, easy-to-read thriller that finds Henry running for his life. Framed for murder and desperate to save his daughter who has been kidnapped by the man responsible for all of this, Henry has no one to turn to except a woman he has never met. Carrie Holmes has just returned to work in the community outreach department at the police station. She takes a call from Henry, who professes his innocence, and she is moved to investigate his story despite the fact that everyone else is convinced he's the killer. I really enjoyed this thriller. I found it a very easy read. While the story is engaging and the reason this is all happening is relatively unique, it's not overly complex. This kept the pages turning quickly. I also enjoyed the characters. Looking back, Gross didn't get deeply into characterization. But the characters are all likeable, even the "bad guys" in the story. Henry is a doctor who is put into a crazy situation, and I think that came out well in the writing. I highly recommend this for anyone looking for a fast-paced thriller that will keep you engaged from beginning to end. Visit the author's website, Facebook page, and Twitter account. This review was written based on a copy of 15 Seconds that I received from TLC Book Tours in exchange for an honest review. The publisher has graciously offered a copy of 15 Seconds by Andrew Gross as a giveaway for one of my readers. This contest is only open to US addresses. To enter, just fill out the Rafflecopter entry form below. The giveaway ends at midnight EDT on July 21, 2012. I enjoyed the books that Andrew co-wrote with James Patterson, so I will definitely give this one a try. That is great that this book was so good. I have heard of the author, now I know from where thanks to Nise, but never read him. I love a good page turner, especially when I'm travelling - I'll definitely consider this for my upcoming cross-country plane ride!